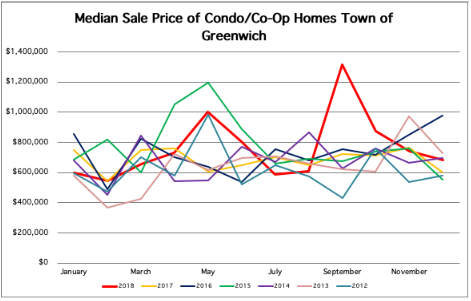 January 17, 2019 (Greenwich, CT) – The Greenwich Association of REALTORS® announces the statistics for home sales in The Town of Greenwich, CT for the month of December 2018. 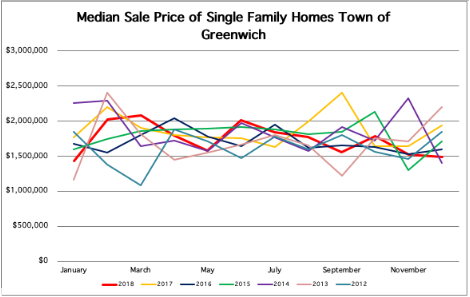 There were 50 single-family residential closings reported during this period according to figures provided by The Greenwich Multiple Listing Service, Inc., the multiple listing service used by REALTORS® in the Greenwich area. The number of single-family residential closings decreased, compared to December 2017 when there were 52 closings in December. The median sale price for a single-family home decreased to $1,487,500 from $1,935,500 the median sales price in December 2017. The average days on the market (DOM) for residential homes was 250 days; which was a decrease from 298 days in December 2017. There were 23 condo/co-op residential closings reported during this time period; which was an increase from December 2017 when there were 12 closings. The median sale price for a condo/co-op increased to $685,000 from $600,000 the median sales price in December 2017. The average days on the market (DOM) for condo/co-op residential homes was 254; which was an increase from 142 days in December 2017. “December 2018 closed out the month with fifty sales, which is similar to the past six years. Greenwich closed out the year as the area in town with the most closings, ending December with twenty-seven sales. Condo/Co-Op sales had twenty-three closings in December 2018; A 91% increase from December 2017. Pending sales as of 8:30am this morning for Single Family homes were 28 and 8 for Condo/Co-Op. December was a strong month that helped us close out the year with a 3% increase from 2017. There were twenty-one more closings end of year 2018 than we had in 2017. As we have started 2019, we have had 16 SF closings, which leaves us off to a positive start of the year”, stated BK Bates, 2018 President of the Greenwich Association of REALTORS®.